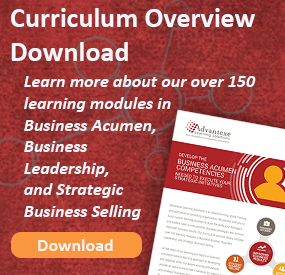 At a high level, most HR and Talent Development professionals think Business Acumen is just about understanding business, but of course it is much more than that. Advantexe wrote a blog called “Defining Business Acumen” which describes business acumen as: The deep and applicable understanding of the system of how a business achieves its goals and objectives. It includes a thorough understanding of the levers that create and position a value proposition to customers and it drives profitability, cash flow, and shareholder value. New hires are the future performers and leaders of the organization. Often new hires enter the organization right out of college with strong backgrounds in history, English, art, sciences, and languages, but they are lacking the fundamentals of business or an understanding of how business works. High potential leaders have been identified as the next generation of leaders and are within 5-15 years of fulfilling their ultimate potential. Once they have achieved their potential, high potential leaders must understand strategic thinking, financial management, marketing, operations, sales, and everything about the system of business in order to make the most appropriate decisions. Often a forgotten audience, thousands of Core Performers wake up every day, come to work, and try their best to execute the strategy of the business. To do this, Core Performers need enhanced business acumen skills to make even better business decisions that drive results. In today’s competitive sales world, understanding and delivering value to the customer from a business perspective rather than from just a product perspective, can be the difference between sales success or failure. Many major US companies have more international business and revenues than domestic. This means thousands of business leaders around the world and in emerging markets need enhanced business acumen skills to execute consistently and with alignment to the organization’s international strategy. In many organizations, Customer Service and Technical Service leaders are the driving forces that support the execution of the strategy and monitor how products and services are delivered to customers. A mistake some organizations make is to keep Customer Service and Technical Service professionals isolated from the business side of the organization. These critical functions could be even more effective and make better decisions with enhanced business skills.